Profaned Greatsword is a Weapon in Dark Souls 3. A ceremonial sword, held in Pontiff Sulyvahn's right hand, representing the Profaned Flame. Long ago, when Sulyvahn was yet a young sorcerer, he discovered the Profaned Capital and an unfading flame below a distant tundra of Irithyll, and a burning ambition took root within him. Temporarily summon the Profaned Flame. Lunge forward and use strong attack to enshroud blade in flame. Cannot be Infused but can be Buffed using the Weapon Art. Its charged heavy attacks shroud the blade in flame momentarily. Fully charging adds 50 fire damage to the weapon. (Tested against a 100% physical shield, 4 chip damage went through only with fully charged heavy. In addition things weak to fire take bonus damage from it.). However, the fully-charged attacks of this weapon use more stamina than that of other Ultra Greatswords. Profaned Greatsword +5 has 605 AR at 40 Strength and 40 Dexterity. Created with the Soul of Pontiff Sulyvahn. I used the zweihander with carthus flame arc and absolutely demolished Sulyvahn. After I got this sword, I could finally become the badass flame swordsman I wanted to be without having to use pyromancies. 10/10 would transfuse again. 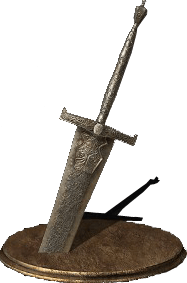 This weapon is what Gwyn&apos;s Greatsword SHOULD have been. Sure the scaling barely improves at +5 but it has a similar look and it has a innate fire buff. It&apos;s almost everything we wanted. For me though it would be perfect if it scaled with strength and faith and even without the innate buff it did fire damage alongside physical damage. It would have B scaling in Strength and C Scaling in faith. This is Tarkus&apos; real weapon, Greatsword is a fake animu version. 709 physical ar with 66 str and 99 dex unbuffed. Highest one stat ar in game together with bkgs excluding the bk axe. Makes bosses a joke. The weapon art can hyper armor any gael&apos;s attack. Even if this weapon was really bad (which it isn&apos;t), I would still probably use it because it looks freaking amazing! A ceremoinal sword(!) REPRESENTING the Profaned Flame. That means he forged this weapon and that it is not the "Profaned Flame" he found. Only a tool to cast the flame on it. Best UGS in the game for quality builds. While two handing, it only requires 15 STR. I&apos;d say this is Dark Souls 3&apos;s own bass cannon. Insane AR and a fire buff to boot. Did it got buffed in terms of damage? If only you can dual wield this with Sulyvahn’s other sword. This is the only UGS i like aswell as the Zweihander. All other feel like weeb weapons. Can anyone confirm if the WA scales with Faith/ Int, making it viable for a pyromancer?